Free guide! Use the Mic with Confidence! I’m sitting in the Intensive Care Unit of Children’s Hospital in Knoxville with my daughter as she sleeps, finally resting after three or four days of what must have felt like drowning for her. It turns out she has double pneumonia. Under the tender ministrations of the medical staff, she is getting better, and although Hannah has taught us that we never know the future, even two minutes from now, the prognosis is good, and we expect to take her home early next week. As I look at the ceiling, though, I see graphic reminders that many parents who have waited agonizing hours in this room have not been so fortunate. 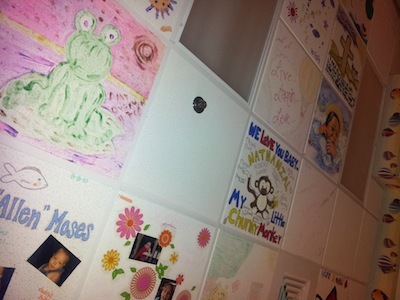 Instead of empty industrial ceiling tiles, patients see a colorful collage of artwork done mostly by children who have stayed here, whiling away the time and contributing to later patients by relieving visual monotony. It is a nice touch. But a few of them come from parents leaving behind a memorial. You can easily spot these tiles; they’re the ones with two dates. They strike me the same way 19th century cemeteries do. Have you ever strolled through an old graveyard and noticed how many tombstones commemorate a child? Some have only single dates for a child who died the same day he or she was born. Many have tiny statues of lambs on top. In some older cemeteries fully half the graves hold the remains of a child, with dates only a few years or a few months apart. This is a room of hope, not a cemetery, but it is a room that has witnessed countless dramas and struggles, the stuff of movies and stories. Maybe these stories aren’t spectacular enough for the big screen, but for the real individuals involved they held all the impact that a Gone with the Wind or a Titanic did for those characters. At this moment, two nurses are working on Hannah, and alarms are going off. I am writing because I can’t really do anything else. I can do little for my daughter right now beyond simply being present, and so I turn to writing, a tool that has always helped me make sense of the world. I don’t know how much time I will have with Hannah. It may be a day; it may be that she will far outlive me. I hold out hope that gene editing may allow her to escape the chains that bind her in this life. (I’m not delusional. I realize it’s a long shot, but a slim chance is better than none.) But I do know that I don’t want to risk one day looking at a tile with two dates and regret that the space in between was so filled with trying to make a living that there was no room to just hold her hand. I’ve tried to post at least twice a week, and I’ve kept that up regularly for 19 months, except for two periods when I took a week or two off. But I need to turn my attention to other things. I’m not leaving, but I’m setting the conscious intention of cutting back to posting only two to four times per month for at least awhile. Effective communication is my passion, but only because it connects us to each other, and I have some connecting of my own I need to do. A cornerstone of communication: what’s important to you? I love this. It speaks straight to my heart. I’ve recently my second job go to have just one job at Roane State. This allows me to come home to my children every evening. Events in my family the past few years have brought home to me the same sentiments you’ve expressed…….enjoy who/what you can while you can. They belong to God and only he knows when he will need them back or what else he will call them to do. Meant to say I recently quit my second job in clinical practice to be home evenings with my kids and advance at my first job. It’s tough, isn’t it, Mandy? Because my wife has physical challenges, I bring in most of the finances to take care of four of us (though she recently started as an independent Thirty-one consultant). I still have to figure some way to being in extra income, but I don’t want to spend all my time on it. I’m glad this weekend I can stay with Hannah as much as possible. Header image by Flickr user Alex Indigo. Used under Creative Commons Generic license.